Kate Allen makes a move toward an isolated ball at Lakeside Field. The senior forward leads NU in goals, assists, shots and points this season. 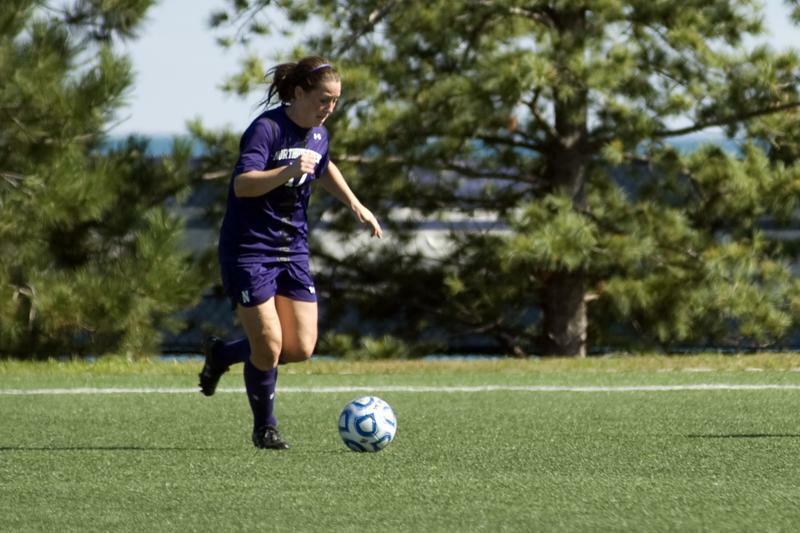 Northwestern will look for its first conference win Saturday when it squares off against Minnesota at Lakeside Field. Moynihan said the team needs to be more consistent. He said he believes NU (2-9-2, 0-5-0 Big Ten) has trailed off in the final third of games, and it has been costly. The Wildcats have outplayed their opponents in many games but have not been able to finish or score the necessary goals to win, he said. “We’ve been competitive every game, we just haven’t had the results,” Moynihan said. Minnesota (9-3-1, 2-2-1) is coming off a huge win against then-No. 7 Penn State. The Golden Gophers netted two victories and a tie in their past three games, with the other win coming on the road against another familiar foe, a nationally ranked Michigan squad. NU, on the other hand, is coming off of five straight Big Ten losses. Moynihan and his team know Minnesota must feel confident coming into this game after such huge victories. The Cats, however, are making a push to get that conference victory as the season winds down. Senior forward Kate Allen particularly feels the urge. “There’s a desire to pull out the win as my senior season finishes,” Allen said. Moynihan identified Allen as a standout player in this group. He said she has consistently been one of team’s best scorers over the past four years, and the veteran is a well-known threat in the Big Ten at this point. Allen leads NU with three goals, three assists and nine points. Moynihan said he anticipates big things from freshman forward Addie Steiner. Steiner saw action in all 13 games for NU and looks to be a rock on this team for years to come. “I want to work really hard to end the season on a good note, and hopefully we can learn from this to make the team that much better and more successful next year,” Steiner said. Steiner has yet to score her first goal, but Moynihan said he is impressed with her play. She has been very close at the post several times and has consistently been very dangerous, the second-year coach said. He said he is confident results will soon follow. Both Allen and Steiner agreed with Moynihan that the team’s biggest issue is finishing. They said the Cats have not taken advantage of the many opportunities to score that NU has created so far this year. Although the Cats have not had the success Moynihan hoped for, he said the team is continuing to improve.